Christmas Nails All Around - Polish This! The first two days of this week were really exciting because I got to paint nails for other people for a change. Sokos Joensuu challenged some local nail polish bloggers to create Christmas nails for their staff, so on Monday and Tuesday I spent the evening creating some nail art with the fellow bloggers from Nerdic Nails, Katjamaria and My Dazzling Nails. I rarely paint anything other than my own nails so this surely was a challenge for me and I have to say that I was a bit nervous doing this, but at the same time I was very excited too. All the products that we used were provided for us by Sokos and we mainly had polishes from their own brand called We Care Icon and also some Lumene and Mavala products. We Care Icon polishes that we used were: Magic Red Charisma, Magic Diamond, Magic Sapphire, True White and Golden Comet. The one Lumene is called Apple Basket - Omenan tuoksua and we had the base coat from We Care Icon and Minute Quick-Finish from Mavala. I borrowed the polishes beforehand and painted some example nails for us, so that it would be easier for the people to choose what kind of nails they wanted. Majority preferred the darker red from We Care Icon called Magic Red Charisma and it's really no wonder since the color is quite gorgeous! 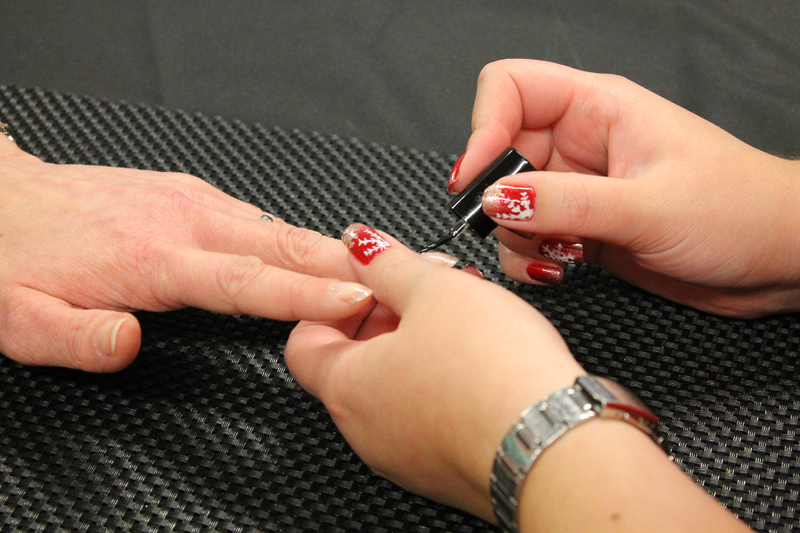 So we got to do quite a few red nails with that Charisma or the Lumene one and with either silver or gold gradient. And of course pretty much everybody wanted to have at least one snowflake on their nails. I also got to do two sets of blue nails which was quite refreshing after so many red ones and I believe Mirka and Katja got to make some santa hats too. This was really a fun experience and something quite different for a change! And I also got some good practice on painting snowflakes. I'm pretty sure I could do those even in my sleep... I will paint at least one more snowflake for you guys, because I thought I would do a tutorial based on these designs for easy Christmas nail art, so stay tuned if you are interested in that! Tell me, which design do you like the best? I love this post! It's fun to paint other people's nails. I like the red with gold snowflake.